Feeling vital, vibrant and full of enthusiasm can sometimes feel completely out of reach and impossible to achieve. Often, we make a few positive changes, but don’t get the health benefits we hoped for, so soon fall back into old habits and patterns. Usually, that is because we are only focusing on one part of who we are, so you might change your diet, but neglect to work on the emotional reason that sub-consciously led you to eat rubbish food in the first place, so very soon, you find yourself back at square one. Luckily, help is at hand. 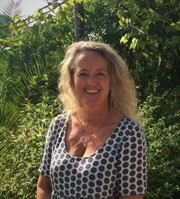 Mandy Elliott is a multi-disciplined holistic therapist, with many years experience in supporting her clients on every level…..spiritually, mentally, emotionally and physically. She will show you how they all have a knock on effect on each other and will gently empower you to take back control of your life. Mandy has been on the ‘holistic path’ since 1990, and if there’s one thing she knows for sure…..if your gut is not in tip, top condition it will affect every aspect of your health. 85% of serotonin and 50% of dopamine is produced in our gut. Colonic therapists have known this for years. They have seen the link between gut health and many other aspects of disease including allergies, depression, and other inflammatory responses in the body. At last, mainstream medicine is catching up with us. Every day new research papers confirm the importance of a healthy gut microbiome (gut bacteria) and its impact on our health. So, whether your problem is bloating, cramping, IBS, constipation, IBD (inflammatory bowel disease), candida or leaky gut, Mandy would love to give you the guidance you need. Homeopathy works by matching a remedy with your unique expression of imbalance…..as in your individual set of symptoms. The chosen remedy works by stimulating the bodies own ability to heal itself, sometimes with dramatic effect. Homeopathy is a very safe and gentle system with no side effects and therefore very useful when working with children and pregnancy. EFT works by removing blockages in our energy system or neurological programming. These blockages are usually created by past trauma’s and can hold us in uncomfortable patterns of anxiety, depression, fear, guilt, shame, stress etc. Past trauma’s can also set up patterns of limiting beliefs, affecting our confidence and self-esteem. EFT is non-invasive and simply works by gently tapping on the end points of energy meridians in order to release the sub-conscious blocks that the body is holding onto. As well as emotional problems, it has also been used very effectively with relieving chronic pain. During your time with Mandy, she will be looking at your unique journey and then use whatever feels appropriate to support you on your road to health. This could be Coaching, Homeopathy, EFT, diet and supplement suggestions……or all of the above. There is no system set in stone as you are an individual and will therefore need different therapies. NB: All payments for consultations are made directly to Mandy Elliott and are not taken by Sophia's Choice. Mandy works from our dedicated treatment room on a Thursday. I started my working life as a singer and dancer, but my toxic lifestyle took its toll and by my late 20’s I was feeling pretty awful….low energy, lethargic, brain fog, with constant gut and ‘lady’ problems! My aunt recommended I go and see this new type of doctor she had found…..a Homeopath….who informed me I had a yeast problem called Candida Albicans. This diagnosis changed the path of my life. I threw myself into changing my diet, taking supplements, having regular colonics and I opened myself up to the idea of a higher power, which put me on a spiritual path of learning and self development. I’m still on that path because I love it. I practice ‘acceptance of what is’ every day and trust the universe will always bring me magical moments…..and it does. 2002 – 2014: Ran ‘Vitality Detox Retreats’. A 4 & 7 day juice fasting retreat. 2013 - Present: Work for ‘Juicemaster’ / Jason Vale as a colonic therapist and health coach at his Juicy Oasis Retreat in Portugal.